Some days there are ravens. Some days, there are even mountain bluebirds. When such things miraculously appear in my own urban neighbourhood I tend to (if at all possible) just drop everything and follow them. I’ve been ridiculously lucky for the past two weekends. It was the raven the weekend before last. She hung around for most of Saturday and Sunday and I was able to take several hours each day just to watch and listen. VIDEOS to follow— so remember to go to the BLOG POST ITSELF to see them. We started our day early when I saw her on the first dog walk of the day. You can see her raven breath in the chilly morning air. In this next clip, I honestly felt she was trying to get through to a particularly slow student when she making her oh-so-carefully articulated speech. But, for me, the highlight of the day was when I realized why it’s often so hard, just listening to her calls, to figure out exactly where she is. Sometimes it sounds like two birds calling to each other. Sometimes she sounds close, a second later, really distant. The mystery was solved on Sunday, when I found her calling in a spot where she was surrounded by walls on three sides. The echo was so amazing that I just stood there for quite a while before I thought to try and video it. Unfortunately, the tiny and uni-directional microphone on my camera doesn’t pick up the echo that well — but you can see her stop and listen to her own voice coming back to her. I wondered if she thought it was a second raven, or whether she did it to sound as if there were more of her and to generally drive the crows crazy. Speaking of driving the crows crazy, I think this is Eric and Clara keeping an eye on her raven shenanigans. Madame Raven completes her morning toilette, heedless of the scolding crows and the clicking cameras. And then, this last weekend, came the bluebirds. I only noticed them because I was scouring the area for the raven. Something darted over an unused piece of grassland that looked, in it’s flight pattern, more like a swift or swallow that the usual small birds I see around here. Upon closer inspection, there was an improbable flash of summer sky blue. Poor Geordie. I’m sure he sighed an enormous doggy sigh as our walk came to an abrupt halt and I started feverishly consulting the Sibley’s Bird app on my iPhone. Not a Western Bluebird then — they have brown/orange chests. Could it be a Mountain Bluebird? I had never seen one, even though I lived and worked for years in the north and interior of BC, which is more their usual spring/summer range. It seemed so odd that they should make a sudden appearance in East Vancouver. The Sibley’s map shows the coast of BC as part of their migration route, so just passing through. They like open grasslands with some trees for shelter and they had found exactly that for their Vancouver stopover. I guess they did some excellent BirdAirBnB research in advance. The piece of overgrown grass had small bushes and fences for them to perch on to view their insect prey before diving in to dine. I “visited” them several times over the weekend, often pointing them out to neighbours passing by. Some of them went to bring their families to see the amazing sight. None of us had ever seen them before. They reminded me of the little birds that helped Cinderella to do her housework and get ready for the ball in the original Disney animation. More real … still magical. The male birds are impossibly vivid. The females are more subtle in the their colouring, but there would still be a spectacular flash of blue from their wings when they took flight. These appearances were, as they say in the furniture flyers, Limited Time Offer Only! … and rest there for a while. 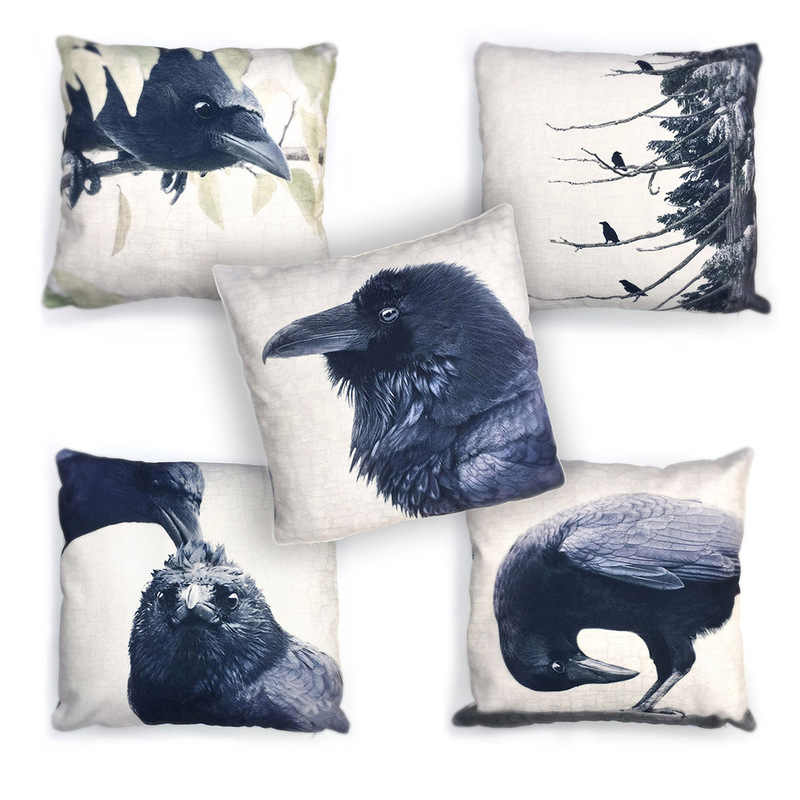 Oh, and if you’re wondering, when will their be bluebird cushion covers? … don’t worry, I’m on it! Coming soon to a couch near you! See the sequel to this post at: Ordinary Days. what a fabulous post, June! I’ve never seen a bluebird in Vancouver, what a treat. That raven was something else too, I hear them calling around our place too, driving the crows nuts. WOW! Wonderful bluebirds! If they are still around, please send them my way. Wonderful post! I have a glass bluebird of happiness that was given to me by an elderly woman which I really treasure. Love the raven call too. Thank you! Trying to work out my camera so will see if I got any good shots. I think they were barred owls. How I enjoy your posts! It seems like the raven was playing with the sounds of its own voice, some sounds on the inhale and some on the exhale? Not 100% sure. And if one can jazz up a few crows so much more fun the better if you’re a raven. The bluebirds are stunning. Thanks, Susan – yes – the raven sounds very much as if she’s having fun and doing some improv with the echo. I also have some video of her responding to firetruck and truck backing up beeping noises. Such fun. I’ve followed you & your wonderful friends, the Crows! I guess you’ll remember me… the Crow Lady!! I have a, what I call, my Crow Wall !!! I have purchased a great number of your works of art. Also, have enjoyed your daily life on your blog. I’m the one that said “I want your Life”. I hope you enjoy this quote, it brought me such joy and more, to share it with you! Thanks, Judith – that is a wonderful quote. I will remember that one.